It wasn’t over for Scott though. After he collapsed, within minutes paramedics had rushed him to the hospital and ran a battery of tests that showed no health problems. 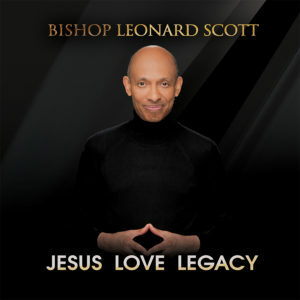 Jesus Love Legacy (Tyscot Records), is Scott’s 14th album (AVAILABLE HERE) and it releases globally on August 31st. The twelve-track collection of songs is arguably one of Scott’s most cohesive and intentional efforts. He collaborated closely with producer, Phillip Feaster (Synergy Music Group), and singer/songwriter, TIFF JOY. The trio co-wrote seven of the set’s twelve tracks, including the upbeat radio single, “Working in My Favor,” which features gospel legend Fred Hammond and R&B treasure, Shirley Murdock. Rance Allen and Kevin Vasser join Scott on the old school funk number, “Power in the Name.” TIFF JOY chimes in on the rousing praise and worship tune, “Here I Am.” There’s a simple and beautiful hymn medley of “I Surrender All” and “Draw Me Nearer.” Scott’s stellar performances on the Christian Pop track “Holy Spirit” and ”Trust and Obey” are particularly spirited. “Because of the accomplishments and legacy of Tyscot Records I have had several people who I regard as gospel icons tell me I am a legend,” Scott says. “And I get it. Because we have been instrumental in the careers of so many gospel greats and survived so many storms of adversity through the years, we are lauded for these accomplishments. But the truth is that I am nothing without Christ. Absolutely nothing. They say I have this legacy, but it is because Jesus has given me His legacy of love, and without that I could do or be nothing of eternal significance. Jesus is the real legend and the source of every legacy of any significance. This entry was posted in Gospel, Reviews, Testimonials and tagged BISHOP LEONARD SCOTT, Testimony, Tyscot by Kris Patrick. Bookmark the permalink.